...... Do you sometimes forget to log time? It is easy to add and change timesheet entries incase you forgot to use the start and stop clock timer. Timesheets have builtin validation that automatically resolves errors including situations where work span across midnight. Statistics and billing information available as graphs and exportable reports. 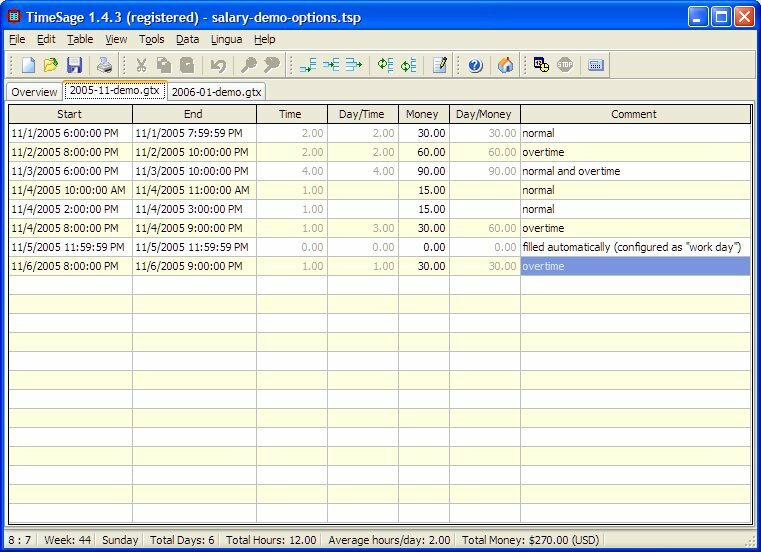 Billing includes sums across selected timesheets broken down by task and group. Keyboard hotkey combination (default SHIFT+CTRL+T) to bring up timesheets window or menu. Configure salary calculations in project options and have timesheets automatically updated. Export timesheets to XML, HTML and CSV files (comma, tab and semicolon) for Excel, Calc etc. Create project links: Share timesheets and notes across LAN for teams of people. Create project links: Custom configuration for regular CSV import/export of timesheets. Qweas is providing links to TimeSage Timesheets Pro 2.2.4 as a courtesy, and makes no representations regarding TimeSage Timesheets Pro or any other applications or any information related thereto. Any questions, complaints or claims regarding this application TimeSage Timesheets Pro 2.2.4 must be directed to the appropriate software vendor. You may click the publisher link of TimeSage Timesheets Pro on the top of this page to get more details about the vendor.